Alonso Berruguete (c. 1488–1561) revolutionized the arts of Renaissance Spain with a dramatic style of sculpture that reflected the decade or more he had spent in Italy while young. Trained as a painter, he traveled to Italy around 1506, where he interacted with Michelangelo and other leading artists. In 1518, he returned to Spain and was appointed court painter to the new king, Charles I. Eventually, he made his way to Valladolid, where he shifted his focus to sculpture, opening a large workshop that produced breathtaking multistory altarpieces (retablos) decorated with sculptures in painted wood. 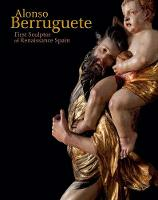 This handsomely illustrated catalogue is the first in English to treat Berruguete’s art and career comprehensively. It follows his career from his beginnings in Castile to his final years in Toledo, where he produced his last great work, the marble tomb of Cardinal Juan de Tavera. Enriching the chronological narrative are discussions of important aspects of Berruguete’s life and practice: his complicated relationship with social status and wealth; his activity as a draftsman and use of prints; how he worked with his many assistants to create his wood sculptures; and his legacy as an artist. C. D. Dickerson III is curator of sculpture and head of sculpture and decorative arts at the National Gallery of Art, Washington. Mark McDonald is curator of drawings and prints at The Metropolitan Museum of Art, New York.